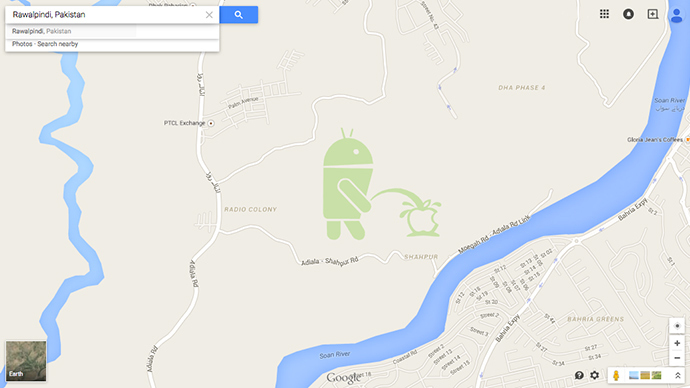 Google and Apple have never been buddies, but their rivalry was taken to a whole new level on Friday, with Google Maps showing the image of an Android urinating on the Apple logo. The picture could be seen by typing in coordinates located in Pakistan. The image was apparently submitted by a user with a sense of humor, through Google Map Maker – a feature that allows for the addition of details such as street names, parks, and places of interest. The program is usually moderated, but perhaps the moderator was on vacation when the mischievous picture slipped through the cracks. “Even though edits are moderated, occasionally the odd inaccurate or cheeky edit may slip through our system. We’ve been made aware of the issue and are working on getting it removed,” a spokesman told Mashable. The tech giant was even able to laugh about it, joking about the Android's future – or lack thereof – at the company. “We’ve terminated the Android figure involved in this incident, and he’ll be disappearing from Google Maps shortly,” Google said, as quoted by the Guardian. The image could be found by using these coordinates, located just south of the Pakistani city of Rawlpindi. Just a few miles east, another surprise could be seen – a patch of green that said “Google review policy is crap,” accompanied by a sad face. The pictures were released on an important day for Apple, which launched its new Apple Watch on Friday. It's not the first time Google Maps has fallen victim to playful pranks. Earlier this month, the White House was shown to have a section called 'Edwards Snow Den,' named after the former NSA contractor who is wanted by the US on espionage charges – and is one of the least likely people to be visiting 1600 Pennsylvania Avenue anytime soon.